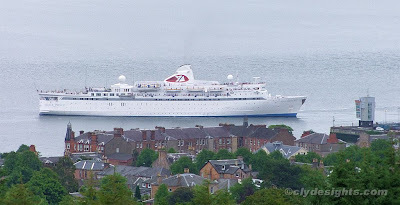 Moving astern and away from Ocean Terminal for the last time, Fred Olsen's cruise ship BLACK PRINCE sailed from Greenock on Sunday afternoon. As she sailed, she gave one long farewell blast on her whistle at the close of twelve years of regular visits to the Clyde. 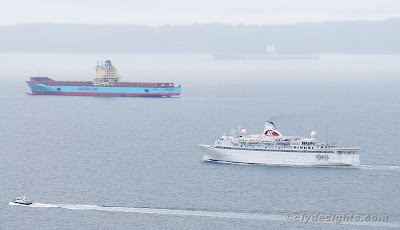 BLACK PRINCE is seen in the second picture heading down the Skelmorlie Channel past MAERSK BEAUMONT, with her sister MAERSK BENTONVILLE lying off Mount Stuart in the background partially obscured in the drizzle. The Pilot Cutter TOWARD was shadowing BLACK PRINCE ready to disembark her Clyde Pilot off Little Cumbrae after she had passed Largs and Hunterston. The veteran then continued on her cruise to Dublin and Liverpool. Another vessel in the Fred Olsen fleet will take over many of her cruises from October, when BLACK PRINCE finally leaves European waters for a new career in South America.